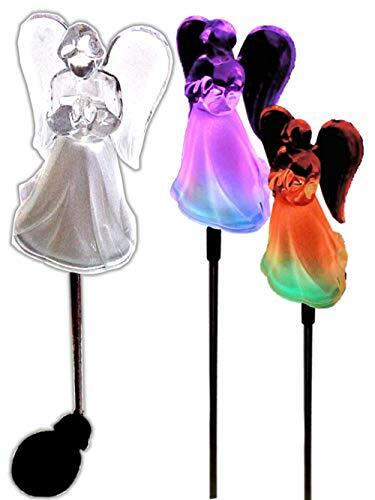 This color changing acrylic frosty angel has a built-in solar panel mid-way down its stake. With 1 LED bulb, it brilliantly creates a blend of multi-color transition at the frosty skirt that is so soothing to the eyes. Its clear wings naturally makes the angel brighten up in the daytime. This angel stake is the perfect addition to patio and garden decor for all seasons. Get it now! No hassle of finding electrical supply: Plug the angel metal stake at any bright spot on the ground and let 1.8" X 1.5" Crystalline Solar Panel charged up a built-in 600 mAh-AA-Ni-Cad rechargeable battery. Totally no need for power cord connection! Long hours of usage: LED lights can shine brilliantly for 8 hour on Full Charge by the solar panel placed under direct sunlight. If you have any questions about this product by BRILLIANT AND MO, contact us by completing and submitting the form below. If you are looking for a specif part number, please include it with your message.